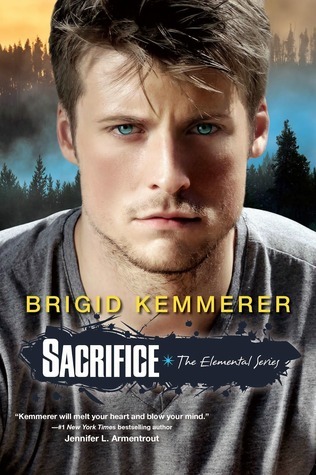 Presenting Elemental #5 Sacrifice by Brigid Kemmerer. The conclusion of all conclusions.Another favorite series ends. Brigid Kemmerer's Elemental series began with a short novella on Michael Merrick and ends with the eldest Merrick again, along the way focusing on one Merrick brother every book (except 'Fearless' and 'Spirit' that focused on Hunter). Of course hot boy grazing the covers of each of the books was a plus too besides its strong plots. 'Sacrifice' proved it with Michael Merrick. He is the epicenter. He is the adhesive or more of a glue that keeps his family together. He is the leader. The big brother and a parent too. And its definitely not a walk in the park with three brothers Gabriel, Nick and Chris and Hunter and all the drama they bring. Michael has always lead a difficult life. He has made many a sacrifices just to keep his family and he would just do it again and again if it meant that his family would be safe. Throw in Elemental magics, enemy guides, relationships and finances and you would truly appreciate what Michael means to his brothers. Action packed, exhilarating, and emotional turmoil at every turn. Life has never been easy for our boys and with the Guides closing in and their penchant for ensuing collateral damage its not only the Merrick brothers and Hunter in the line of fire but Michael's girlfriend Hannah and her little boy too. Having always been self reliant, it has always been difficult for Michael to ask or even accept help or unload his burden with others. But fate and circumstances and the mysterious enemy closing in and specifically singling him out starts to crack him. He learns the hard way that help offered doesn't always mean danger and that his little brothers are not so little anymore. He learns that blaming himself won't make things better and must learn to lean on others, most of all to his girlfriend, Hannah. Of course, Hannah gets her moments as well. Very much similar to Michael in more ways than one. She knows the difficult life Michael leads. A mother at fourteen, a firefighter and soon to be paramedic, Hannah like Michael has problems sharing her troubles with the others. But like the previous stories it is not about them and their relationship this time around. Its about Michael. His brothers. Hunter. their loved ones and about them all that stands in the line of fire. With sparse romance Kemmerer spins an emotionally charged conclusion. Michael and Hunter's relation needs to be mentioned too. Michael had all but adopted this fifth, ie., Hunter when he felt the loneliest of all and its this kindness that serves them when they least expect it. Dramatically and emotionally charged. Brigid Kemmerer presents a pretty different style of conclusion. A shocking death and coming full circle, quite an anti-climate end, the author puts a new meaning to the term 'sacrifice' and we appreciate it all the more. "An exhilarating and emotionally charged conclusion to the Elemental series"